The Kirk Gibson Foundation was created in 1996 to provide college scholarships to students – both athletes and non-athletes – at Waterford Kettering and Clarkston High Schools. Kirk’s parents, Robert and Barbara, taught at these schools for many years and bestowed upon Kirk the value of education and community. Kirk and his family have always believed in giving back. In 1997 Kirk and Ambassador Peter Secchia co-chaired the Victory for MSU national campaign with a goal to build a state of the art facility to help student athletes at Michigan State University achieve academic excellence on and off the field. Today, the Clara Bell Smith Student Athlete Academic Center at his Alma Mater, is nationally-recognized offering a wide range of service to all Division 1 student athletes at MSU including: academic counseling, computer labs with instruction, tutoring in all subjects, career planning and more. 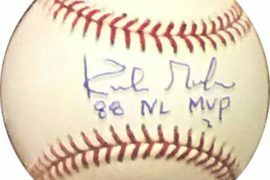 In 2010, Kirk made a generous contribution to the foundation by donating proceeds after auctioning off his 1988 Los Angeles Dodgers World Series Trophy and his 1988 National League MVP Award. After being diagnosed with Parkinson’s Disease in 2015, Kirk expanded the mission of the foundation to raise awareness and funding for Parkinson’s Research. By promoting collaboration, cooperation and teamwork the Kirk Gibson Foundation strives to impress the significance of this to patients, caregivers, neurologists, therapists, researchers, scientists, family, and friends. When we all collaborate, optimum benefits result. In 2017 Gibson and Secchia came together again. 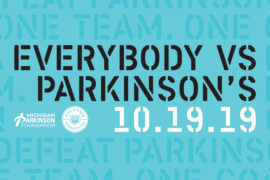 In recognition of the foundations emphasis of collaboration, they planned the “Gibby & Friends vs Parky” event which raised $1.2 million to research Parkinson’s disease through collaboration between MSU’s College of Human Medicine, Spectrum Health, and Van Andel Institute. Grant proposals are being scored and funds will be distributed as seed money towards possible grants from the National Institute of Health (NIH). Creating Awareness Other goals of the Foundation are create awareness and understanding about Parkinson’s disease. Too many individuals are in denial about the disease or fear a stigma associated with Parkinson’s and delay seeking medical help. Early diagnosis and treatment can provide years that are virtually symptom-free. It’s imperative to know that life expectancy is about the same as for people without the disease. With diagnosis life will change but with proper medication and other movement therapies, symptoms can be managed to continue an active and enjoyable life. 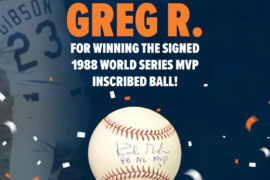 The Kirk Gibson Foundation will continue to fund and grow patient outreach programs and awareness by hosting special events all over the country and abroad.